Our approach is to focus more on the pivotal early grade of children from 12 months to 6 years. 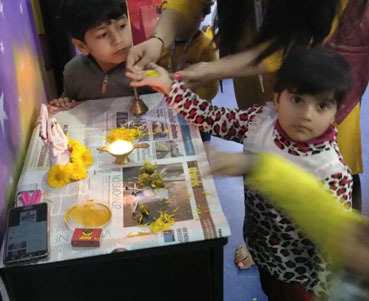 Our team of passionate educationists who come from esteemed institutions work tirelessly to apply insights from cutting-edge research in the field of educational neuroscience and child development to early years’ education. The school provides an academically challenging curriculum with the flexibility to meet the need of individual children in these critical early years. The focus on teaching children in a unique manner with the help of Montessori material establishes a strong foundation in reading, composition & mathematical skills and encourages individual creative expression. 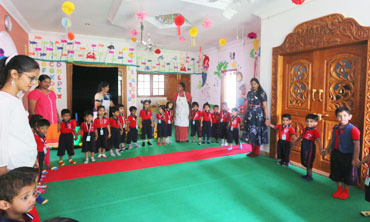 Thus, kids become independent learners at the early age of 3-5 years. It helps them instill independent learning, creative thinking and excellent communication skills and further arm them to succeed in tomorrow’s world. The cognitive approach in a progressive way with the help of Dr. Maria Montessori teaching materials thus enhances gross motor skills, sensory development, hand-eye coordination and adaptation to the changing environment in their sensitive period of conscious as well as the subconscious phase of absorbent mind. All children want to learn. With the freedom to investigate the world around them, they will become active learners. At Cambridge Montessori Pre School, children have the freedom (within limits) to choose their own activities. With this freedom of choice, children will become enthusiastic learners and this will aid them to develop self-discipline. The Cambridge Montessori Pre School’s environment is child-centered. Children progress at their own pace. Lessons are given on individual basis or in small groups. This enables the teachers to discover more about each individual child and their inner development. Instead of instructing with rote lectures, handouts, worksheets and lesson plans, our Montessori teachers will offer guidance. The classroom will often contain several stations each containing toys which allow children to explore and learn. For example, a common station in our Montessori classroom will have a bucket of LEGO blocks and several pictures of simple objects like an apple or a house which the children can build if they want. Other stations might have books, crayons, a xylophone or other engaging activities. The whole idea behind our Montessori classroom is allowing children to learn through playing. Dr. Maria Montessori believed that children educate themselves, “It may be said that we acquire knowledge by using our minds, but the child absorbs knowledge directly into his/her psychic life”. “Simply by continuing to live, the child learns to speak his native tongue” (Montessori, 1966). This is the concept of an absorbent mind. Our Montessori method of teaching is a modern educational movement that encourages teachers to view children and classroom education differently than the common teacher-student relationship. Instead of focusing on academic education, our Montessori method focuses on respecting and encouraging each child’s individual differences, providing a nurturing environment to teach social interaction and emotional skills. 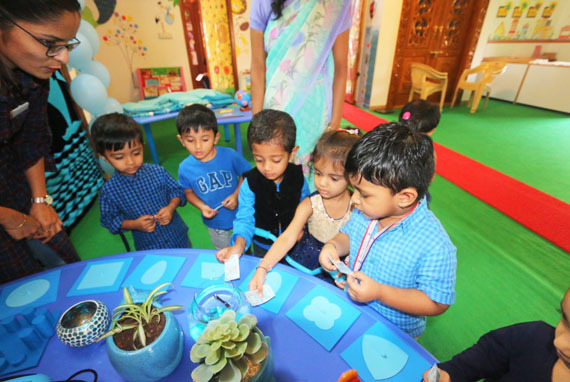 Our Montessori method is most often applied at the preschool level due to its focus on early child development. It is necessary for the teacher to guide the children without letting them feel her presence too much, so that she may always be ready to supply the desired help, but may never be the obstacle between the child and his/her experience.